Findley's research and teaching address civil wars, terrorism, and development. He uses field experiments, statistical and computational models, and some interviews. He conducts ongoing fieldwork in Uganda, South Africa, and Malawi. 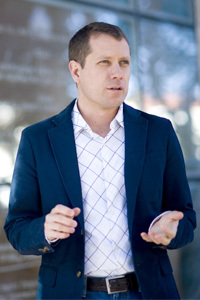 Findley's publications appear in American Journal of Political Science, Journal of Politics, International Studies Quarterly, British Journal of Political Science, Journal of Conflict Resolution, Journal of Peace Research, Public Choice, Complexity, Minnesota Law Review, and World Development, among others. Civil wars pose one of the greatest threats to international peace and security today. Recent conflicts in contexts as diverse as Rwanda, Libya, Russia, Syria, Colombia, and India demonstrate the devastating consequences of violent civil conflict. Indicative of this broader trend in the outbreak and continuation of civil violence is the fact that 90% of UN peacekeeping operations since 1989 have been deployed to disputes that have a significant internal conflict component. Despite the threat posed by such conflicts, recent advances toward peace in areas such as Namibia, El Salvador, Cambodia, and Mozambique as well as some of the Arab Spring cases o↵er encouragement about the prospects for averting or resolving long-standing civil conflicts. This course is structured to consider various theoretical approaches in the study of civil wars and their management. Throughout, we will sample from numerous cases of civil war and violence paying close attention to the conflicts in South Africa, Rwanda, and the former Yugoslavia. The first segment of the course explores the basic dimensions of civil wars and ethnic violence. In particular, we examine the origins and development of ethnic and political identities and how they structure the parameters of conflict. Core questions include: What do we mean by “ethnicity”? Is a given identity inherent in individuals, or is it subject to change? If manipulable, do “instrumental” elites use ethnicity to their advantage? Is there an ethnic dimension to all civil violence? The second section of the course is devoted to the process by which conflict among individuals and groups turns violent, with an emphasis on civil wars in Africa. Key questions include: What political incentives do leaders have to drum up support through violence? How do economic factors such as natural resources a↵ect a group’s opportunity or willingness to engage in violence? What causes internal violence to “spill over” into other countries or regions? The third and final section addresses strategies of conflict management and resolution. We consider some of the following questions: Does a feasible set of preventive solutions to civil wars exist? What is successful conflict management? Which strategies employed by international actors are most successful, and why? What are the obstacles to implementing conflict resolution measures? The course will enable students to develop an understanding of: the nature of various identities, how identity contributes (or not) to civil war, what other dimensions shape civil war, and how such wars are resolved. In addition to considering various theoretical approaches, three detailed case studies, and brief examinations of many other cases, by writing the research paper you will carry out research on civil wars of your choice and should develop a solid understanding of them. These activities and assignments should help you (1) gain a knowledge of countries and wars, theoretically and factually, (2) write professional research papers, (3) give oral presentations, and (4) think critically, analytically, and synthetically. I hope that our sessions will be engaging, informative, and participatory. I eschew a strict lecture format. Instead, we will engage in a variety of activities including lectures, personal writing exercises, partner and group work, class discussions, video clips, demonstrations, problem-solving activities, and other critical thinking exercises. I value and will solicit your input on class activities both at the beginning of the semester as well as around midterm. I will make every reasonable e↵ort to incorporate these ideas in the classroom. and consider many varieties of terrorism over time and throughout the world. This course is required of all first year PhD students in Government. It provides a general introduction to the scope and methods of the discipline of political science. Topics include an overview of the discipline, the philosophy of science, theoretical and methodological approaches to the study of political science, fundamentals of research design, practicalities of carrying out research, and normative aspects of the profession. Students will be graded on a set of five assignments as well as participation. Shared Standards. 2nd ed. Lanham, Md: Rowman and Littleeld. Inference in Qualitative Research. Princeton: Princeton Univeristy Press. O'Hear, Anthony. 1991. An Introduction to the Philosophy of Science. Oxford: Clarendon Press. Schwartz-Shea, Peregrine, and Dvora Yanow. 2012. Interpretive Research Design: Concepts and Processes. New York: Routledge. This course will help second and third year IR students (first or second field) develop a fully realized research paper designed to be a master’s report and/or submitted to a journal. Students will be graded on semi-weekly drafts of their papers and component parts (50%) and the quality of the final product itself (50%). b) Course Description: This graduate research seminar addresses the theoretical and empirical study of political violence primarily within states. It will survey leading research investigations from within political science along with discussion of innovations in other disciplines including geography, economics, and sociology. We will consider a variety of theoretical topics and empirical approaches that deal with the complexity of conflict and violence that we observe globally. Particular topics include the causes and consequences of violence, the process by which violence escalates and deescalates, and how violence differs from political behavior more generally. This course is required of all first year PhD students in Government and provides a general introduction to the discipline. Topics include an overview of the discipline, the philosophy of science, approaches to the study of political science, fundamentals of research design, practicalities of carrying out research, and normative aspects of the profession. This course is structured to consider various theoretical approaches in the study of civil wars and their management. Throughout, we will sample from numerous cases of civil war and violence paying close attention to the conflicts in South Africa, Rwanda, and the former Yugoslavia. The first segment of the course explores the basic dimensions of civil wars and ethnic violence. In particular, we examine the origins and development of ethnic and political identities and how they structure the parameters of conflict. Core questions include: What do we mean by ``ethnicity''? Is a given identity inherent in individuals, or is it subject to change? If manipulable, do ``instrumental'' elites use ethnicity to their advantage? Is there an ethnic dimension to all civil violence? The second section of the course is devoted to the process by which conflict among individuals and groups turns violent, with an emphasis on civil wars in Africa. Key questions include: What political incentives do leaders have to drum up support through violence? How do economic factors such as natural resources affect a group's opportunity or willingness to engage in violence? What causes internal violence to ``spill over'' into other countries or regions? The third and final section addresses strategies of conflict management and resolution. We consider some of the following questions: Does a feasible set of preventive solutions to civil wars exist? What is successful conflict management? Which strategies employed by international actors are most successful, and why? What are the obstacles to implementing conflict resolution measures? Collier, Paul, and Nicholas Sambanis. 2005. Understanding Civil War: Evidence and Analysis (Volume I: Africa). World Bank Publications. Gourevitch, Philip. 1999. We Wish to Inform You that Tomorrow We Will Be Killed With Our Families: Stories From Rwanda. New York: Picador. This course will provide an introduction to randomized experiments in political science. The course will consider the basic methodology of experiments, including randomization, intervention, measurement, and inference with an emphasis on application of these ideas to a research question of interest. A project will be required and will entail the identification of a research question, the development of a theoretical argument to address the question, and the execution of an experiment that applies the methodology to provide an answer. This course introduces the topic of terrorism and addresses the core ideas in studies of terrorism. We examine the historical origins of terrorist violence, the primary causes of terrorist acts committed both by opposition and government forces, as well as counterterrorist measures taken by states and international organizations. We also focus on common misunderstandings of terrorism many of which stem from conceptual challenges and distortions in public discourse. Particular emphasis will be placed on transnational dimensions of terrorism and the role it plays in international relations more generally. In addition to cross-national evidence, many specific examples including Chechnya, Israel, Northern Ireland, the United States, and Peru will be considered. Martin, Gus. 2010. Understanding Terrorism: Challenges, Perspectives, and Issues. 3rd ed. Thousand Oaks, CA: Sage Publications. Hoffman, Bruce. 2006. Inside Terrorism. 3rd ed. New York: Columbia University Press. This graduate research seminar addresses the theoretical and empirical study of political violence primarily within states. It will survey leading research investigations from within political science along with discussion of innovations in other disciplines including geography, economics, and sociology. We will consider a variety of theoretical topics and empirical approaches that deal with the complexity of conflict and violence that we observe globally. Particular topics include the causes and consequences of violence, the process by which violence escalates and deescalates, and how violence differs from political behavior more generally. Ethnic conflicts and civil wars pose one of the greatest threats to international peace and security today. Recent conflicts in contexts as diverse as Rwanda, Russia, Colombia, and India demonstrate the devastating consequences of violent civil conflict. Indicative of this broader trend in the outbreak and continuation of civil violence is the fact that 90% of UN peacekeeping operations since 1989 have been deployed to disputes that have a significant internal conflict component. Despite the threat posed by such conflicts, recent advances toward peace in areas such as Namibia, El Salvador, Cambodia, and Mozambique offer encouragement about the prospects for resolving long-standing civil conflicts. This course is structured to consider various theoretical approaches in the study of civil wars and their management. Throughout, we will sample from numerous cases of civil war and violence paying close attention to the conflicts in South Africa, Rwanda, and the former Yugoslavia. Divided into three sections, we will explore: 1) The basic dimensions of civil wars and ethnic violence including the origins and development of ethnic and political identities and how they structure the parameters of conflict; 2) the process by which conflict among individuals and groups turns violent, with an emphasis on civil wars in Africa; and 3) strategies of conflict management and resolution. The goal of the course is to enable students to develop an understanding of: the nature of various identities, how identity contributes (or not) to civil war, what other dimensions shape civil war, and how such wars are resolved. Gourevitch, Philip. 1999. We Wish to Inform You that Tomorrow We Will Be Killed With Our Familes: Stories From Rwanda. New York: Picador.